Traditionally we celebrate Tu B'Shevat by eating fruit, specifically the seven fruits of Israel, including grapes, figs, pomegranates, olives and dates. This recipe goes well with the tart pomegranate seeds, and I've included some mint leaves for freshness. It helps provide contrast to the sweet white chocolate. Line a baking sheet with parchment paper. Cover with a single layer of saltines (or other salty crackers). Spread the crackers with a layer of caramel sauce. Freeze for 10-20 minutes. Meanwhile, melt the white chocolate with the coconut oil over a double boiler or in a microwave. Spread the melted white chocolate over the caramel sauce. 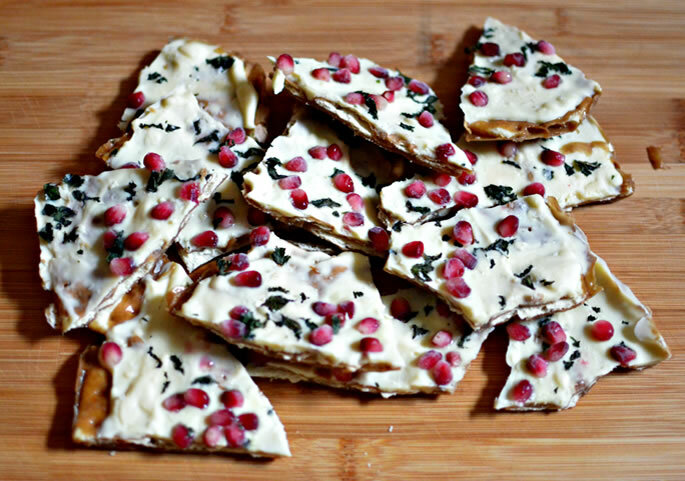 Sprinkle with the pomegranate seeds, mint leaves, and flaked sea salt. Freeze. Break into pieces. Serve. I would like to receive news and updates from Kessler Family Chabad Center by email. We use the vegetarian designation to label recipes that do not contain actual animal (ie. meat, chicken or fish). But we do include recipes with dairy and eggs in this category. Our vegan recipes contain no animal products at all. I would like your advice regarding giuten free recipe .